KonMari is the lifestyle brand of tidying consultant and Netflix star Marie Kondo. 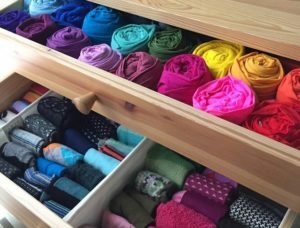 The KonMari Method is also the name of the organizing system she popularized. Konmari is going great because I have no emotional attachment to a lot of old art things so I'm just.. I CAN THROW THIS AWAY. For KonMari skeptics, this gentle animism is the kind of thing that leads people to nod along with Nicole Silverberg at GQ and say, “I mean … I love you, girl, but no.” But even Silverberg was won over eventually. When she KonMari’d her house, she held off on thanking her clothes as she discarded them, “mostly because it’s dumb,” she writes, but then she accidentally thanked one of her favorite shirts as she threw it out. Where does KonMari come from? Marie Kondo, a Japanese woman obsessed with eliminating clutter, began her consulting business at the age of 19. KonMari is a play on her own name, with Kon– from her surname and -Mari from her first name. She introduced her trademarked KonMari Method in her 2015 book The Life-Changing Magic of Tidying Up. It is system for paring down possessions (getting rid of things don’t “spark joy”), folding clothes, and organizing belongings. Her bestselling book—followed by her hit 2019 Netflix show Tidying Up With Marie Kondo and the media attention it received—helped make KonMari into a verb for using the KonMari Method to declutter one’s spaces. Kondo is also sometimes used in the same manner. KonMari can refer to the KonMari Method or carrying it out, e.g, I’m gonna KonMari my room this weekend and get rid of everything. The KonMari Method has been the subject of many popular articles in such outlets as The New Yorker, The Atlantic, and The Washington Post. It’s also been the subject of many personal blogs/social media posts. I wish I could KonMari my brain. Some people like to post before-and-after pictures of or commentary on their newly organized, decluttered spaces. Some include the hashtag #konmari. Note that KonMari is not Marie Kondo’s name but her method and brand, an occasional source of confusion.